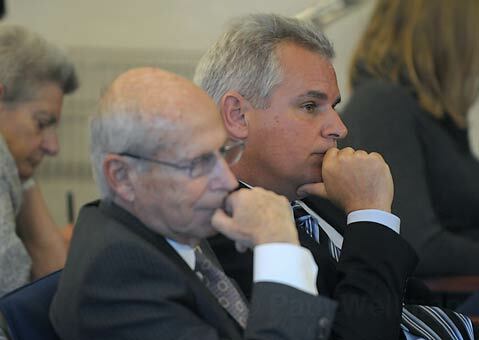 Steve Pappas (right) with legal counsel Stanley Green. Steve Pappas found no civil judge, either at the superior or appellate court level, who saw any fraud in the 2008 election, which he lost by 806 votes out of 35,524 to now 3rd District County Supervisor Doreen Farr. So he’s headed to the criminal realm, having submitted to authorities what he calls evidence of voter fraud in that election, Pappas announced via press release Thursday. The news comes at the same time Pappas is seeking further discovery from Farr related to her claim for attorney’s fees from defending the lawsuit Pappas filed against her. The well-funded Pappas, whose fight has been strongly backed by rancher Nancy Crawford-Hall, has lost every argument he has made in court thus far, but the fight has led to extensive legal bills for Farr. The most recent legal decision out of the court of appeal in the case, however, granted her the ability to recover legal fees. But Pappas is taking that opportunity to pursue time records and agreements related to Farr’s campaign workers as well as individuals affiliated with voter registration drives. The basis for discovery, says Pappas attorney Stanley Green, is to determine how reasonable the fees her attorneys are seeking, but also to see “what personal benefits were derived from opposing the election contest.” Farr is only entitled to a portion of fees spent for public benefit, not personal benefit. The obvious benefit, of course, is that she won the election. And since she was named in Pappas’s suit rather than the county (because of the way the Election Code is written), she had to defend her victory. But Green claims it could go further. “If her staff was concerned some of what was done would come to light they’d have more reason to contest the election,” he said, not going as far as to accuse her personally. “I don’t know what she knew or didn’t know.” Green would not give any of the names of people mentioned in the police report. What is a little more obvious is that Pappas is preempting any decision one way or another by authorities by issuing a press release, quoting from a police report not available to the public and making allegations that even authorities have not made while refusing to make specific names available. “He’s just trying to recycle the same old stuff,” Seymour said. A court date is scheduled for April 4.